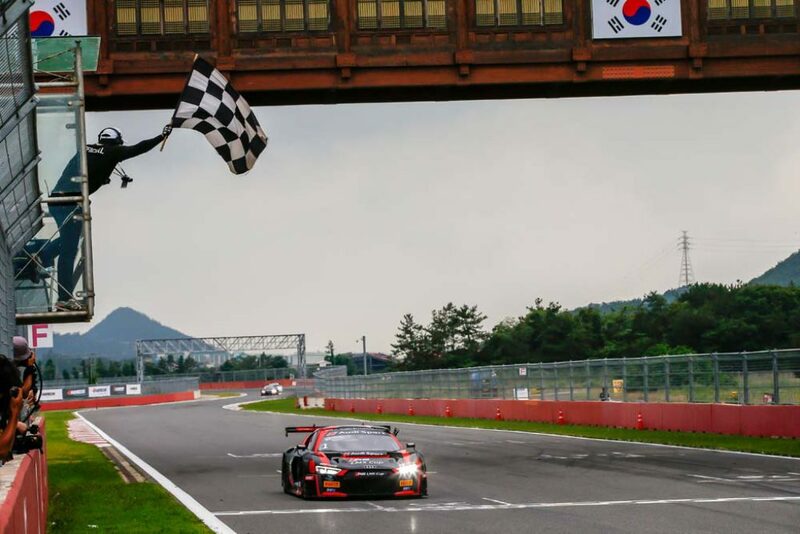 Reigning Audi R8 LMS Cup champion Alex Yoong kept clean air between his Team Audi R8 LMS GT3 and an incident-filled Round 5 to win on the 5.6km Korea International Circuit. 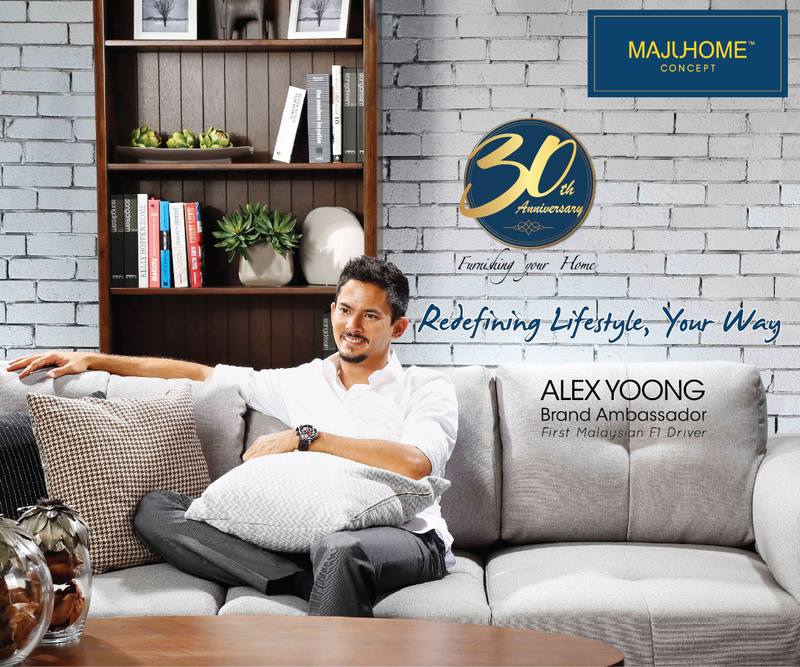 Alex Yoong celebrating his win. Crossing the line more than five seconds behind him was OD Racing Team’s Mitch Gilbert, who finished an impressive second from fifth on the grid carrying 20kg of success ballast, his fourth Cup podium in a row. 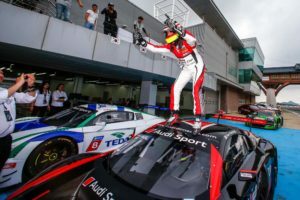 Audi TEDA Racing Team’s Shaun Thong stormed from third-last on the grid to finish third. Overall classification leader Alessio Picariello of MGT by Absolute missed out on a podium finish, despite closing up to Thong and piling on the pressure after starting from eighth on the grid and carrying 35kg of success ballast. His fourth place finish sees him increase his margin at the top of the leaderboard on 101 points. 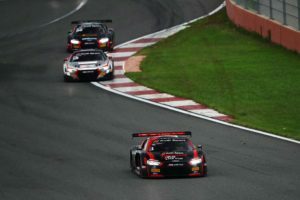 Gilbert moves up to second in the title chase (66 points), while Yoong’s win sees him jump from seventh to third (62 points) ahead of FAW-VW Audi Racing Team’s Cheng Congfu (59 points). With light rain ahead of the morning’s 15-minute qualifying session, the field headed out on the 5.6km track shod with slicks. However, as the rain intensified, the session became a race to switch to wet weather tyres and clock a quick lap before the flag. Martin Rump timed it perfectly and his Champion Racing Team had the Estonian equipped with wets fast enough to grab pole, despite missing out on the second free practice after suffering a technical issue. Fastest lap for Race 5 goes to Alex Yoong. Chen continued to impress, locking in second on the grid just over one-tenth of a second behind. 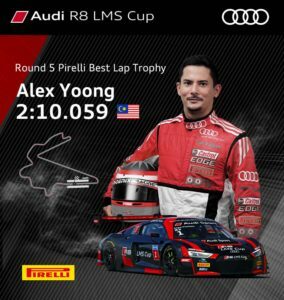 Yoong was joined by Am+ driver Anthony Liu of Absolute Racing on the second row, with Gilbert and another Am+ class driver, Jeffrey Lee, behind. With the form book well and truly turned upside down, as the lights went out at the rolling start, Rump got away to lead the pack. However, it was pandemonium behind him as the hard-charging, slicks-shod field furiously battled for position on the damp track, two and three abreast with several drivers leaving the track in the heat of battle. Yoong was out for victory though, and quickly reeled in the race leader with Gilbert on his tail. Chen, on the other hand, did not get away well and spun, dropping him down the order. As Yoong seized the race lead, followed by Gilbert who followed him in to second, Rump had no answer as he struggled to find traction. The 21-year-old Estonian pushed hard to regain his lead but spun on the greasy track, allowing Thong and championship-leader Picariello to get past him. Rump dropped to fifth, where he was to finish. View the full Audi R8 LMS Cup Round 5 Gallery here at Pit Talk Asia.